Teams search for items in the Mall that are all one color. Choose a color from your birthday party theme or choose two and let teams hunt for different colors of items from the same list. 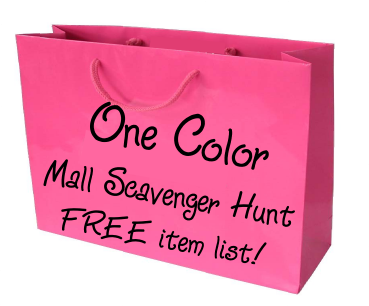 This scavenger hunt is best played with a digital camera, but if your mall won't allow pictures to be taken inside the stores it can be modified to be a cheap scavenger hunt. Hunt for presents and prizes for the birthday party or give each team $10.00 and have them purchase as many items as they can with it. Make sure to get receipts so the stores and amounts can be verified. and tweens party theme ideas.